Intrinsic excitability is one of the pillars of neuronal behaviour . Combined experimental and modelling studies of neuronal excitability often provide an important insight into the brain functions. In this work we analyse a unified model that we derived for CA1/3 pyramidal neurons in Hodgkin-Huxley formalism . We explore the variations of the model behaviour through parameter sensitivity analysis. Model validation against the experimental current clamp data shows that our model reproduces the behaviour of pyramidal cells very well. A characteristic feature of CA1/3 pyramidal cell response is a higher frequency of the first spike pairs. We define an excitability measure that quantifies parameter sensitivity in our model and takes into account this unique feature of the response. 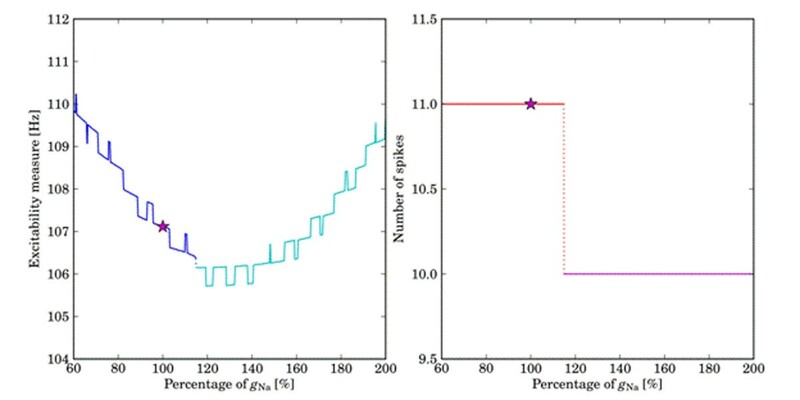 Sensitivity analysis of the maximal conductance of the combined Na+-currents; panel (a) shows the excitability measure ranging over the given percentages of the maximal conductance of Na+-currents; the original value of the maximal conductance is marked by a (magenta) star.